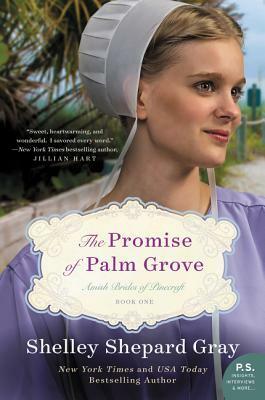 Today I’m reviewing The Promise of Palm Grove, the first book in the Amish Brides of Pinecraft series, by Shelley Shepard Gray. Amish bride-to-be Leona is thrilled to be in Florida, on a mini vacation in the pretty town of Pinecraft. Her girlfriends think she’s happy because she’s away from the stress of wedding planning. They have no idea that Leona’s real joy is in being away from her fiancé. Edmund is a good man and will make a decent husband . . . just not for Leona. The more time she spends with him and his overbearing ways, the less she wants to be his wife. Her cousins are sure Edmund is the right man for her—and their certainty makes Leona begin to doubt herself. But when a chance encounter with a wayward cat brings her face-to-face with a handsome, fun-loving Amish man named Zachary Kaufmann, Leona’s faced with two vastly different futures. All right… now I want to move to Pinecraft, Florida! I know what you’re thinking… Pinecraft is noted for their Amish and Mennonite population — and I’m not Amish (or Mennonite) — but I really think I’d love living there among the plain people. I had the hardest time putting this book down (don’t start it at night — you won’t want to put it down until you finish it). I have to say, I figured Edmund wasn’t much to like… and when I was done, I still didn’t find much to like about him. I could say much more, but I’ll leave it at that… if you want to know more, just read the book! You won’t lose interest in this story… not just the main characters, but some wonderful characters building up their own story. I’m hoping we’ll hear more from them in the sequel. Thank goodness I don’t have to wait to read book 2 (a review coming up next time). Great job, Shelley! Of course, I wouldn’t expect anything but the best from you! Sounds like another great book to read by Shelley Shepherd Gray. Thank you for the review. Blessings!